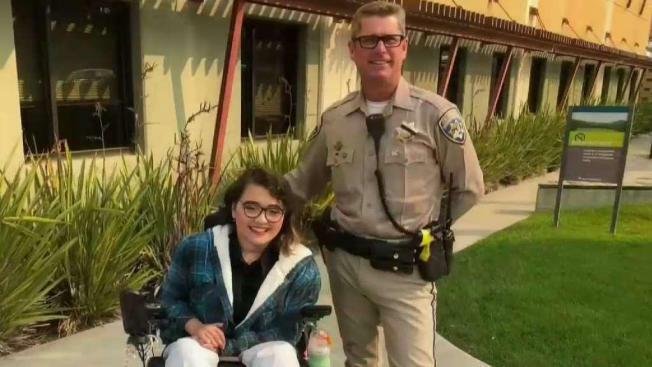 Sixteen years after a California Highway Patrol officer saved a little girl's life, the officer and the girl were reunited this weekend, according to the CHP Contra Costa office. In March 2002, Officer Maguire responded to a crash on Alhambra Valley Road in unincorporated Contra Costa County in which a year-and-a-half-old girl named Christine was severely injured. When he arrived at the scene, Maguire provided life-saving treatment that helped save Chistine's life before she was air-lifted to a hospital, the CHP said. Sixteen years later, Christine went to the Contra Costa CHP office, looking for Maguire to thank him, the CHP said. It's the first time the two have seen each other since that fateful day. Maguire and Christine held a long embrace and sat down to chat about their first meeting so many years ago. "Someone had pulled you out of the car, and you were lying on the ground with a blank stare on your face. You weren't breathing," Maguire says to Christine in a video of their conversation on Facebook. "I got you breathing again ... and here you are today, so that's a good thing." Christine is now a biological science major planning on transferring to Cal State East Bay.